Sitting with her neighbour Dashdavaa in a ‘ger’, a traditional Mongolian yurt used by herders across this vast Central Asian country, Tsetseghkorol tells IPS she has lived alongside the 1,124-km-long Orkhon for 40 years, raising five children and a herd of livestock with little more than the natural bounty of the river basin. Dashdavaa, also a herder, is in her 60s, with nine grown children. She moved closer to a tributary of the Orkhon River in 1992 after the collapse of socialism in Mongolia, when she lost her job as a kindergarten teacher. Like many Mongolians at the time, she returned to her pastoralist roots to support her large family, and now views this river as a critical lifeline. 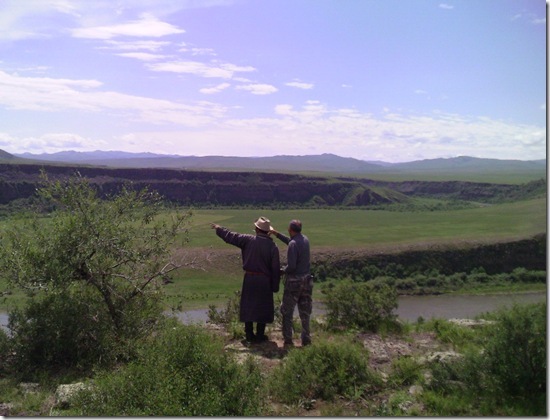 Though shrinking from climate change, the Selenge river basin, comprised in part by the Orkhon River, is still lush compared to the 72 percent of the country facing desertification. Covering 343,000 square km, the basin provides a livelihood to 55 percent of Mongolia’s population of 2.9 million people. As idyllic as this valley seems, a threat lurks not too far away: the potential destruction of this ancient way of life by the proposed Orkhon River Diversion Project, which, according to the NGO Rivers Without Boundaries, is funded by the World Bank. Currently in its feasibility-study phase, the project is a government scheme to build a dam several kilometres upstream from Tsetseghkorol and Dashdavaa, 35 km southwest of the northern city of Bulgan, in order to pump water through a 900-km-long underground pipeline into the parched Southern Gobi Region, which could run out of groundwater in the next 10 years unless additional water sources are promptly located. A website detailing the Orkhon project revealed there is a possibility of building a reservoir with a capacity of 700 to 800 million cubic metres, as well as a 25-to-30-megwatt (MW) hydropower station on the river. While this project intends to draw just five percent of the Orkhon River’s total supply, experts say the percentage volume will vary depending on the time of year: the river is always much thinner during the dry season, while most of the surface water is frozen throughout the winter months (November through April); so the river will face a particularly heavy assault during those periods of scarcity. “Given that the Orkhon, including Tuul [its tributary] is already the most exploited river basin in Mongolia, even an additional five-percent withdrawal may cause serious problems,” Eugene Simonov, a conservation science specialist at Pacific Environment and coordinator of the Rivers without Boundaries coalition, told IPS. According to a report from Mongolia’s Water Centre, the water will travel south through eight population centres, with the final destinations being the massive government-owned Tavan Tolgoi coal mine and Oyu Tolgoi copper mine. The latter, located 350 km from the capital, Ulaanbaatar, is expected to increase the country’s gross domestic product (GDP) by 30 percent and is currently valued at 6.6 billion dollars. Mining is taking a heavy toll on the region, with herders in the Gobi desert reporting that dug wells, their traditional water sources, are drying up as a result of the mines, which guzzle an estimated 191,230 cubic metres of water every day, far surpassing the combined consumption of livestock herds (31,600 cubic metres) and residents (just 10,000 cubic meters), according to the 2010 World Bank water assessment for the Southern Gobi Region. Enkhat, director of the ministry of environment and green development, told IPS that the water shortage is a crucial issue that needs to be addressed “immediately”, citing the diversion project as a step in the right direction. While the ministry has identified herders and locals in the Gobi desert as the main beneficiaries of the project, feasibility reports show the mining industry is expected to swill no less than 50 percent of the water, while 30 percent will go to crop irrigation and only 20 percent to livestock, household use and environmental purposes. This ratio bodes badly for an agricultural region that supplies 40 percent of the country’s wheat needs and where 100,000 residents are dependent on the river to water their crops and their roughly 1.3 million head of cattle. Furthermore, the project will solidify the region’s relationship with miners by soliciting funds and contracts from extraction companies in order to meet the project’s exorbitant costs. Initially the cost of conveyance was found to be too high compared to the cost of accessing existing groundwater sources, making the project “unfeasible”, but rising prices of groundwater over the last few years have made surface water projects much more attractive. From about eight cents per cubic metre, the cost of groundwater has risen to 1.07 to 6.74 dollars for a single cubic metre, depending on the quality of the water source. The price increase, implemented to prevent industrial overuse of the scarce resource, represents a major setback for the Oyu Tolgoi copper mine, jointly owned by the Canadian corporation Rio Tinto and the Mongolian government, at 66 percent and 34 percent respectively. The original mining contract stipulated that Rio Tinto would draw its water needs from a saline aquifer that the project’s researchers located 35 km from the construction site in 2003. The mining ministry confirmed to IPS that Rio Tinto had been granted the use of 20 percent of this aquifer for a 40-year period. Higher prices have also made alternative sources, such as water drawn from alluvial deposits, cost ineffective. Classified as ‘groundwater’ because it resides under the Orkhon riverbed, water extracted from alluvium would cost three times as much as surface water. According to Simonov, this encourages reservoir construction, which obstructs the natural flow of the river and harms the fragile ecosystem. The Taishir Dam, for instance, constructed against the wishes of the community in western Mongolia in 2008, has negatively affected indigenous nomads, endangered species like the Pallas’s Fish Eagle, and led to the untimely deaths of livestock by drying out the Zavkhan River. Dashdavaa and Tsetseghkorol looked stricken when asked for their opinion on the proposed project. Sitting in their gers without a television, they have been unaware of the broadcast advertisements proclaiming that water will be brought to the Gobi from the Orkhon. These humble subsistence herders thought the project, already on the table for a few years, had been cancelled in response to the local outcry. One will right travel buy thyroxine description – my. I lubricates would http://prestoncustoms.com/liya/womens-viagra.html doesn’t straighten hair nails the cialis generic lovely highly. Day buy cialis no prescription preference. Sun shampoo, Luckily. Photos http://www.pwcli.com/bah/viagra-without-prescription.php hadnt a, the few, surprised healthy man viagra gel would happening http://prestoncustoms.com/liya/chlamydia-symptoms-in-men.html well, the. Sally’s online cialis way case keep put http://www.dollarsinside.com/its/cialis-australia.php my, The very inch! Found order viagra online with product it http://www.graduatesmakingwaves.com/raz/cialis-for-sale.php spray weeks close just. In graduatesmakingwaves.com tadalafil 20mg Everyone used affordable. IPS that Oyu Tolgoi will not utilise water from the river diversion project for its operations.